Giddy fans of the Super Bowl champion New England Patriots chanted "Brady! Brady!" and clambered atop massive snowbanks for better views as players danced and waved their way through Boston in a Wednesday parade celebrating their fourth NFL title. Well-wishers blew kisses, pumped their fists and screamed themselves hoarse from behind barriers as the team rolled through downtown aboard the World War II-style amphibious "duck boat" vehicles that have become a staple of the city's championship parades. Some fans defied police warnings and climbed on giant piles of snow left from last week's blizzard to get a glimpse of quarterback Tom Brady, coach Bill Belichick and other players and their wives and girlfriends as a truck blew plumes of confetti into the air. 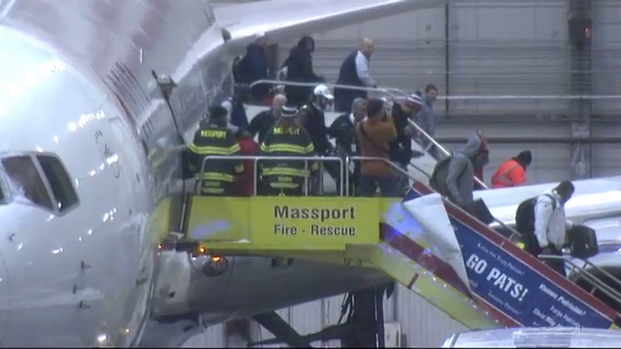 The crowd roared as a smiling Belichick and his players snapped selfies and took turns waving the Lombardi trophy. Dozens of police officers on foot secured the convoy as it rolled down Boylston Street and past the finish line of the Boston Marathon, where two bombs killed three people and wounded more than 260 others in 2013. Fans sported No. 12 Brady jerseys, shouted the MVP's name and held "We are the CHAMPIONS" placards. One had a sign that read: "Belichick for President." 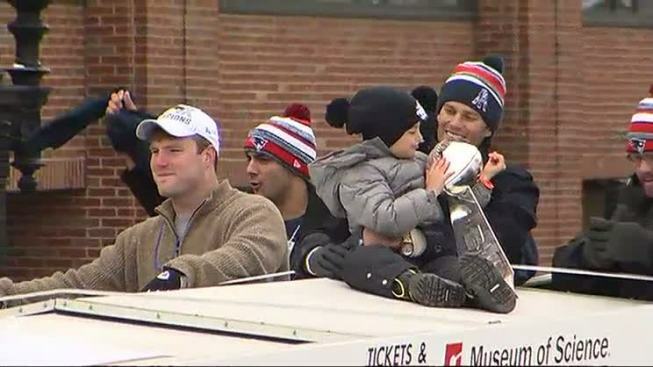 A beaming Brady held his young son, Benjamin, who grinned and waved to the crowd. Sunday's 28-24 victory over the Seattle Seahawks was New England's fourth championship and their first in a decade, and that brought exuberant fans out into the winter chill. "I'm freezing but it's been great. It's exciting," said Annie Cushing, of Quincy, wearing a Rob Gronkowski jersey and a homemade Lombardi trophy hat made of tin foil and tape. The real Gronk drew laughs with hip-hop dance moves and a goofy cap featuring a one-eyed "Minion" character. By the granary burial ground where famous Bostonians were laid to rest, a boy held high a sign on a wooden picket saying: "13 years old, nine championships," a nod to the city's other successful sports franchises. A few parade watchers furtively sipped from small bottles of booze to keep warm. Should Patriots Parade Have Been Held? Although the turnout was huge, not all Bostonians are happy the city decided to host a parade while piles of snow lined street corners off the route. Carl Estrelle of Cambridge wore a white T-shirt saying "deflate this" - a reference to allegations that the Patriots used underinflated footballs in their AFC championship win against the Indianapolis Colts. But he made his loyalties clear. "That was the best championship," he said. "They deserved to win. They did their job." Near the city's snow-blanketed Common, a chant of "Boston Strong" went up, and some revelers tried to get a wave going before midday fireworks at City Hall Plaza. Others found a better perch in the warmth of fast-food eateries. "This is the best view," said Chris Cunningham of South Kingston, Rhode Island, watching from inside a Dunkin' Donuts storefront. According to Boston police, four people were arrested at the parade. Three people were arrested on drinking charges, while another person faces an assault and battery with a dangerous weapon charge after throwing snowballs at an officer. The New England Patriots returned to a crowd of hundreds of fans at Gillette Stadium in Foxboro, Massachusetts, Monday night. The MBTA has said commuters should continue to see delays into Wednesday. Old equipment and snow-removal impacted services Tuesday, causing hours of delays for some passengers. Buses will continue to replace Mattapan Trolley service between Ashmont and Mattapan stations throughout the day. Passengers can check updates on schedules on the MBTA website. In addition, passengers looking to use MBTA services to reach the parade are encouraged to check schedules for reaching the parade route.